The focus of the Alabama Udall Center will be the role of inflammation and immune response in the progression of Parkinson's. 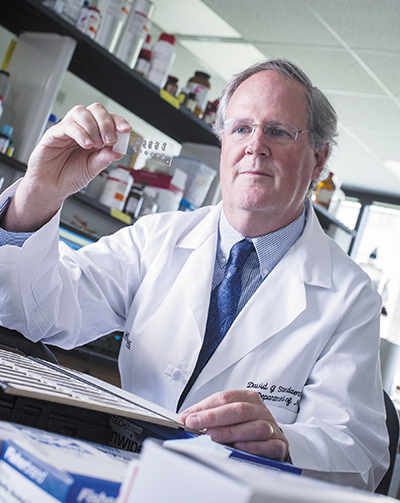 Understanding the role the immune system plays in Parkinson's is a relatively new approach to the disease, a development in which UAB played a role. "Our first grant requests were rejected," said David Standaert, MD, PhD, chair of the Department of Neurology, "because we were told that everybody knows the immune system isn't involved with Parkinson's. We pushed back and eventually turned the tide. It's now a well-accepted concept. "The turnaround came as a result of the work of a post-doctural fellow whose background in immunology caused him to question whether there was a connection. He got us started looking, and we realized there was a pretty big role of inflammation in Parkinson's. UAB's deep expertise in immunology contributed to a synergy of our interest in Parkinson's and the existing expertise in the immunology program." Now, as a result of the grant, the Alabama Udall Center has launched three primary research efforts. "There is a clinical project that is recruiting patients with very early Parkinson's," Standaert said. "We are doing detailed studies of immune activation in those patients. One of the major tools is brain imaging with a PET ligand to detect inflammation in the brain, the chemical DPA 714, and we're the first site in North America to use it. "That is an important tool and we'll have other studies including spinal fluid analysis, analysis of blood monocytes, genetics, clinical examination, and MRI imaging. The patients will be followed for up to five years. We hope to learn whether there is inflammation in the very early stages of disease and the nature of that inflammatory state." In addition there are two animal research projects. professor, Department of Cell, Developmental and Integrative Biology. "She is studying some of the signal pathways we think are involved in Parkinson's-related inflammation called JAK/STAT signaling," Standaert said. The JAK/STAT pathway delivers communications from outside of a cell to the cell nucleus. Disruption of that pathway can lead to a variety of disorders, including immune disorders, and it may be a target for therapeutic intervention. The other animal study is on the LRRK2 kinase enzyme and its role in inflammation, which is being led by Andrew West, PhD, until recently co-director of the Center for Neurodegeneration and Experimental Therapeutics and the John A. and Ruth R. Jurenko Professor of Neurology at UAB and now a professor at Duke University, where he will continue his Udall Center work. "LRRK2 is a gene that has been linked by human genetics to Parkinson's," Standaert said. "People with LRRK2 have a high risk of the disease, so it's a known cause, and that's why we are studying it. "We hope to coordinate the data we collect in the human subjects, which is very detailed, with what we can learn through these animal model studies, and in the end, we would like to find ways to modify the immune response to have a treatment for Parkinson's." Standaert sees the potential for a treatment resulting from this research, even perhaps within five years. "I would really like to find a treatment I can take to the clinic and give to my patients. I've been seeing Parkinson's patients for 20 years now. We have a lot of immune treatments in medicine. If we can adapt those in some way and bring them over to Parkinson's, it might be a fairly short path," he said. One patient has already been enrolled in the study, and Standaert is seeking others. Individuals can contact the clinic through (205) 934-0683. Physicians are encouraged to call 1-800 UAB MIST for more information. The Brigham and Women's Hospital; Boston, MA; Director: Jie Shen, PhD. Emory University; Atlanta, GA; Director: Thomas Wichmann, MD. Johns Hopkins University School of Medicine; Baltimore, MD; Director: Ted Dawson, MD, PhD. Northwestern University; Chicago, IL; Director: D. James Surmeier, PhD. Stanford University; Stanford, CA; Director: Thomas J. Montine, MD, PhD. University of Alabama at Birmingham; Birmingham, AL; Director: David Standaert, MD, PhD. University of Michigan; Ann Arbor, MI; Director: William T. Dauer, MD. University of Minnesota; Minneapolis, MN; Director: Jerrold L. Vitek, MD, PhD. University of Rochester; Rochester, NY; Director: E. Ray Dorsey, MD, MBA.